Welcome welcome, it is that time of week again. Time for you to share what you have been up to in the past week. There are always so many great links, but I can only feature a few. Let's take a look at some from last week. The cutest colorful and organized craft closet shared by Fancy Frugal Life. June & Bear shares this wonderful living room transformation. I love that sign. I would love to hang out on this colorful front porch. Check out this makeover at Coastal Cottage Dreams. 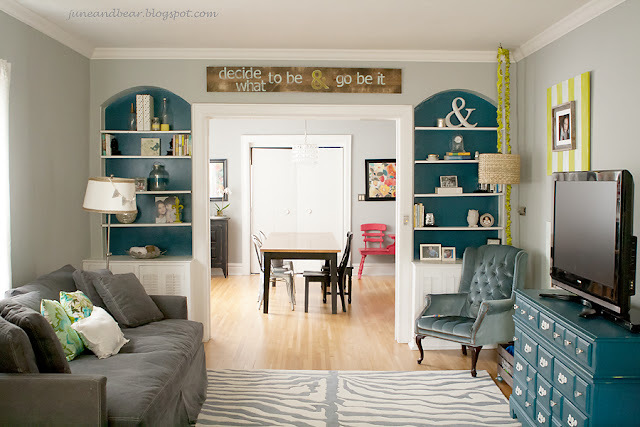 Oh, how I love the colors of this hutch transformation by A Bit of Whimsy. 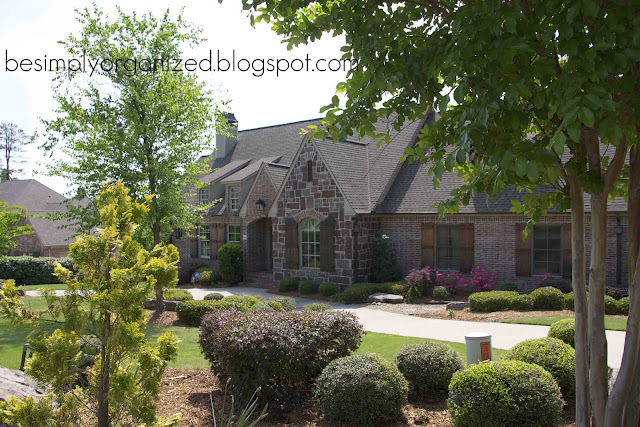 Wonderful tour of the outside of this beautiful home shared by Simply Organized. This stunning ceiling was a lot of work. Check out the steps it took at Studio of Decorative Arts. 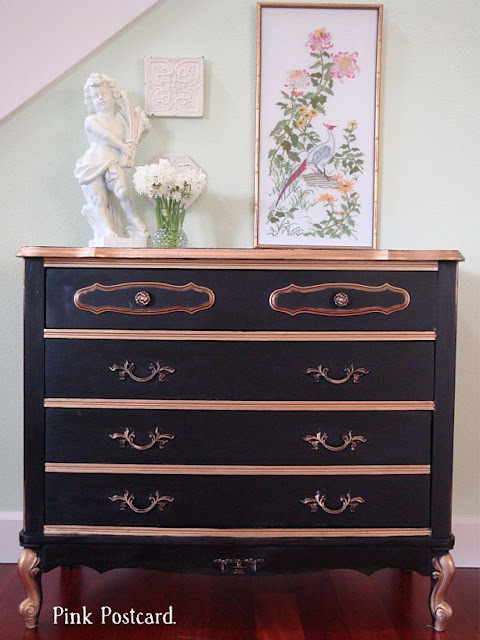 Pink Postcard shares this gorgeous black and gold chest. T-shirt transformed into the cutest shrug by Trumatter. After you look at all those features you may need a piece of chocolate cake. This one looks really good and moist and easy to make shared by CondensedLoveHome. Thanks to everyone who joined the party last week. If you were featured you can grab a "featured" button from my sidebar. Today is a special day. My first born came into this world 33 years ago. Not sure how that is possible seeing that I am only 39. a hem cough cough! Hi Kim! I sure do love that olive bucket that you scored. I'm cringing to think of how many of those I may have passed over, not realizing how great they would look. Thanks for hosting! Thanks for hosting Kim. 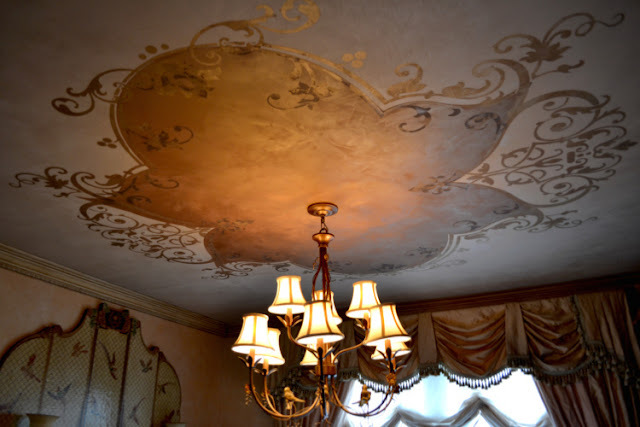 Great features...I really loved the painted ceiling. Happy Birthday to Ryan...actually you are 49..remember LOL! Thanks so much for hosting WOW! Happy Birthday to Ryan! Thanks for hosting Kim. Love your bucket! Seems you had quite a day! Thanks for hosting! Great features as usual Kim! Love June & Bear living room! Happy b-day to Ryan too! Hi Kim, Love that painted cabinet with the blue interior and looking at that ceiling made "broke neck" memories kick in from my days of decorative painting - we did several similar and it's rough on your neck - we even glued Swarovski crystals all around the design!!! - but how gorgeous they are when they are finished. so very excited to see my living room featured! thanks so much. happy birthday to your firstborn. and thanks for hosting. Beautiful features, Kim. I'm off to check them out! Thank you for hosting! Great features Kim. Thanks for hosting. Thanks for hosting Kim. Your party is always a great referral for pageviews for me! Love all the features this week. Especially the hutch. Thanks for hosting again. You sure don't look like you could have a 33 year old son. I love the features you have this week. Amazing talent there is. Nice features....That ceiling is amazing and I plan to make that T-shirt shrug. Thank you for hosting. Happy birthday to your baby boy! A Happy Birthday to Ryan! I never have figured it out how our children keep getting older like that and we don't! Wonderful features!! Thank you for hosting! Kim, we must have the same taste. I love your features this week! Thanks for hosting! Happy Birthday to Ryan. Lovely features! Thanks for hosting!! Happy Birthday, Ryan. Thanks for hosting, Kim. Great features. Great features this week as always. You don't look old enough to have a son 33?? Happy birthday to Ryan and thanks for hosting! You are waaaaaaay too young to have a 33 year old! Thanks for hosting Kim. Your features are great - especially June & Bear's living room. I love everything about it. Take care. I love June & Bear's living room, thank you for showcasing it! Off to be inspired. Thanks for all the inspiration, great features. Thanks so much for hosting every week Kim. Happy Birthday to your first born! Where does the time go? Thanks for hosting, Kim. I'm seeing a lot of interesting link-ups this week! Thanks for hosting Kim! Hope your family enjoyed Ryan's birthday! Thanks for hosting a party for us! AAAAAAAAAAAAAAAHHHHHHHHHHHHHHHHHHHHH!!!!!!!!! I WAS FEATURED!!!!! THANK YOU!!!! I am so sick with a flu and told my husband: I have to join this party... I am coming to bed soon... Came here and read through the post... SURPRISE!!!!! Found my cake at the end!!!! Thank you so much, Kim!!! I am HONORED!!!! I am going to grab a button, then post in today's party!!! Sweating now, I am not sure if it is fever or excitement, LOL!!!! Kim, I got so excited I forgot to say Happy Birthday to your baby!!! I was shouting (my voice is really raspy because of the cold) to my son downstairs, about being featured, lol! He is 17 and the love of my life! I know, how did we get to have GROWN UPS for babies???!!! Last year my son actually asked THIS VERY CAKE for his Birthday. I cut into squares and made a "pile" as cute as I could on a cake plate and placed candles in some of the squares! Those are some really great features from last week..I loved them all....the ceiling treatment is magnificent! Oh my God! Did I just get featured? Thank you so much Kim! I'm so excited. What fabulous links again! Thanks so much for hosting Kim! Happy Birthday to your first baby! Thanks so much for hosting~wonderful features! Thank you for hosting the party, Kim! That t-shirt shrug is the best and I can't wait to make one. As always, I'll be surfing all those wonderful blog buttons to see what everyone did. It's always so inspiring! Great features as always. Thanks for hosting Kim! Just wanted to thank you again and I really enjoy reading your blog and linking up. So, thank you again for hosting this week! Trumatter, 37, really?? Wow!! You are too nice and you just don't see the lines in my picture. Not calling them wrinkles yet. Love...Love...LOVE the fern in the olive bucket ! Good call ! Fun closet and porch floor...I want that brownie for breakfast! Thanks for hosting Kim! I love your new olive bucket! Happy Birthday to your #1 and you! Also Happy Birthday to Ryan! Happy Wednesday, Kim! Thanks for hosting! Great features. Thank you for hosting a great party. LOL Kim! You were leaving a comment over at our place while I was linking up over here. :-) Thanks so much for the sweet words! Hi Kim - and a Happy Birthday to Ryan too. 33 years. Just yesterday. Thanks for hosting. Seriously, you are too young to have a 33 year old! Thanks for hosting today! I'm glad to be here again this week, thanks so much for hosting! Thanks Kim for hosting the fun party! In my current issue of Country Living mag there is an olive bucket just like yours. I wouldn't of known what it was if I had not read your post first. Happy Birthday to your son Ryan! That is my favorite "boy" name! Happens to be my favorite NASCAR driver's name too. :) Have a great sunny day! I love love love that olive bucket Kim!!! So fantastic!! Happy Birthday to your Ryan! (I have a first born named Ryan too!) Thanks so much for hosting! Thank you for hosting...so many great ideas and love how you feature a little of everything! Thank you for hosting, again, Kim. I love this part of the week. So much to look at. Hello, first time linking up, and a new linky follower! Glad to see someone is in my age bracket! Hi, Kim. I can't believe how many projects are now linked up each week -- congratulation and thank you for hosting! I started following you before you even had your first WUW. I don't have my own blog (due to a full time job, a husband, three teenagers, and three dogs) so I really love blurfing, and yours is one of my favorites. I respect you because you stay true to your style, don't jump on the trends bandwagon, yet still keep your decor fresh. Thanks again! thanks for hosting, everything looks so good at the party, can't wait to go thru them. I am loving that china cabinet! Hi Kim...Thank you for featuring my ceiling design...and happy day after birthday to Ryan too! I put up another project in my home today - my old world range hood. Hope people will love it as much as my ceiling (and it was less taxing on my back!). Thank you also for emailing me to tell me to turn off the word verification. I've received so many more comments because of that. So - thanks for that alone!! So glad that you are doing these link parties - it really helps people to get to know other bloggers and their work! Thanks for letting us share what we love to do every week. LOVE the features this week! It is so fun to see so much creativity out there!! BTW-LOVE your new stools!! Creative and sharp looking!